← Who would you picture if you were told someone had a disability?? Does an oversupply of spaces or places for disabled people, particularly wheelchair users, contribute to abuse of the system? Does the emphasis on provision for wheelchair users – who are less than 8 per cent of disabled people. – discriminate against others with a disability. (The majority of impairments are not visible) Click here for more numerical information about people with disabilities in the UK. What are your views? Have you experience or known about abuse of the system? What would improve provision for all disabled people and minimise abuse? For example, were there too many spaces allocated for disabled people allocated for the football world cup, so that those paces could never have been filled and police understand that some fans who bought tickets on the black market may have taken wheelchairs in order to get around normal security to enter the stadium. Do you think that these tickets were spare – or were people who really needed them being deprived of the opportunity to attend? Amid the mad scramble for tickets, some are believed to have acquired concession passes intended for disabled fans. Police will now investigate whether the fans with wheelchairs in the disabled section did indeed require the assistance and have legitimate passes for the area.. Given that the requirement for a wheelchair does not always mean that an individual depends on its assistance all the time, it is a sensitive issue and one which officials are having to probe fully. In the UK there is a legally government laid down ratio of normal car parking spaces to the minimum required number of disabled spaces provided. The minimum number is 2 marked disabled parking bays or 6% of the total number of bay must be reserved for marked out for disabled parking. 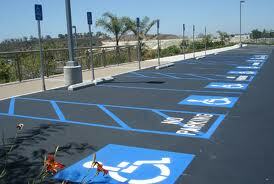 Up to 34 bay the requirement is 2 disabled, above 34 bays 6% of the total number of bays must be marked disabled. Is this too many, about right or too few? Should elderly or infirm people, who are unlikely to be classified as disabled be able to use those spaces? Does this mean that non-disabled drivers are more likely to use the spaces as they always seem to be empty? And what about provision in your country? Are parking spaces or other spaces allocated soley for disabled people? If so, how do people qualify to use them? What provision is made in places of entertainment, public buildings or public transport? How is provision protected for disabled people? This entry was tagged attitudes, challenges, disability, wheelchair users. Bookmark the permalink.